If I do not have internet facility on my mobile phone – How to check my Bank Account balance? How to do Fund Transfer using my Mobile handset? I can give missed call to my Bank’s Toll-Free number to check my Bank balance or receive last few transactions details, but it would be more convenient if I am able to perform other banking related services through Mobile banking. Is this possible? Yes it is possible. Dial *99# from your mobile handset and access your bank account details. No internet is required. The service works across all GSM service providers and handsets. 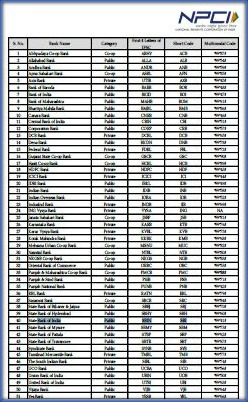 As of now, 51 banks are offering this Mobile Banking service. *99# is a USSD (Unstructured Supplementary Service Data) based mobile banking service from NPCI (National Payments Corporation of India) that brings together Banks & TSPs (Telecom Service Providers). Using *99# service, you as a bank customer can access mobile banking services by dialing *99# from your mobile that is registered with the bank. You can access your bank account without enabling internet service. This service uses voice connectivity. 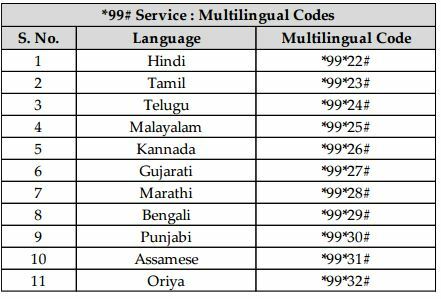 *99# is the common service code across all telecom service providers. No additional charges if you use this service while roaming. But Rs 1.50 (per session) will be deducted from your mobile account balance for using this service. This service works on all GSM providers and mobile handsets. You can use this service any-time and any-where (round-the-clock). There is no need to install any APP on your mobile handset to use this mobile banking service. Fund transfer request can be initiated 24/7 (round the clock) using the *99# service including on holidays. The Funds remitted using the *99# service can be received by the beneficiary 24/7 . Mobile Banking services available under *99# ? Value Added Service – Dial *99# to check if your Bank account is linked to your Aadhaar number or not. How to access Mobile Banking Services? The pre-requisite to use *99# service is that your mobile number should have been registered with your bank(s) for the mobile banking services. If you are already using mobile banking, you will be able to use this service without any additional registration by dialing *99# from your GSM mobile handset. You will receive a welcome message from NUUP (NUUP- National Unified USSD Payments). Click OK. 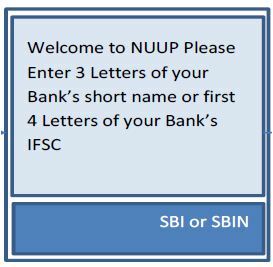 Enter either 3 letters of your Bank Short name (or) first 4 letters of your Bank’s IFSC Code (or) 2 digit Direct Code. For example – Short name for SBI is SBI, First 4 letters of IFSC code is SBIN and the 2 digit direct code for SBI Bank is ’41’ (you can Dial *99*41# directly to access your SBI account). How to do Fund Transfer by dialing *99#? 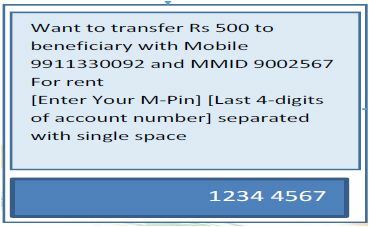 Kindly follow the above procedure and select the option ”Fund transfer using MMID’ (Mobile Money Identifier). Enter your MPIN to authenticate this transaction. You have to select the option ‘Fund transfer using IFSC code’. Enter Beneficiary Account Number, IFS Code (11 digit), Amount and Remarks (Optional). Key-in your MPIN to authorize the transaction. You have to select the option ‘Fund Transfer using beneficiary Aadhaar number’. 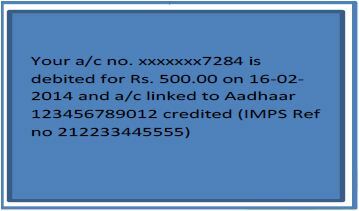 The beneficiary will then receive the amount to the bank account which is linked to his Aadhaar number. Using *99# service through your mobile handset is very easy and convenient. But, do not share your MPIN used for fund transfers with anyone. Else, it can be misused. Also, note that there is an option to change/generate MPIN in the list of services offered by *99# service. Once can easily generate new MPIN if they have access to your Debit Card. If you lose your mobile, report this to your bank and deactivate mobile banking services immediately. error 549 on airtel network persistent since one week. No readdress yet. SIR I AM TRYING SINCE 2 DAYS(WHEN DIALING *99#) ALL TIME ITS SHOWING ERROR OCCURRED ( 549) PLEASE TRY AFTER SOME TIME. PLEASE GIVE ME IT’S SOLUTION. *99# is this is chargeable Banking service . For each transaction you will been charged @ 50 paisa from your registered mobile Number . if you have no balance in your mobile , you will not able to use this service . & get error message like ( Error 549 ). But, my account balance is not low. So, please help on this. whenever I am dailing *99# getting response external application down…..why this proble……what to do to solve this problem ….first I was using syndicate bank account…at that time *99# working good…when I started corporation bank account …this problem started…..
i get notificationsin my mob when i take cash from atm. If you have already registered your mobile number for mobile banking services, there is no need to register for this facility, you can dail from the same number and avail this facility. If you have already registered your mobile number for mobile banking services, there is no need to register for this facility, you can dial from the same number and avail this facility. Whenever I dialed *99# it charged 50paise and I couldn’t complete the transaction also, popping out some error message. not working in SBI system. always shows accounf does not exist. What is the limitation of fund transfer using IFSC per day..
Their is a really big error in this software as it is necessarily made for black and white phones which do not operate n android or ios or windows well a really important thing here to know is that those phones also do not contain a space bar. The designer of this facility made this on an android and had the space bar button on it where as when in the interface when debit card no and expiry is needed their the instruction is separate them by space, but how to give it in black and white phones like nokias. You have not suggest any solution. Just now I dialed *99# from my idea number and my account balance deducted by 100 rs. which is mobile banking charge IDEA customer care guys told me, is that ??? I have two savings bank account with SBI at two different branches. How can I get details of my account regarding both the accounts please. I tried this i am receiving credit and debit messages to my registered mobile no but when i tried this ussd code it is saying we are unable to process your request .How can i fix that problem. Can i register a same mobile number to two different accounts maintained in two different banks? Dear Pradeep..Yes, you can do so..
can get 2 MMID for two different account? I have SBI, SBM and Canara Bank accounts. 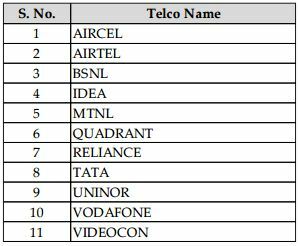 Registered all of them to single mobile number. While Canara bank account has no issues. *99# query for both SBI and SBM gives details associated with only the SBI account. 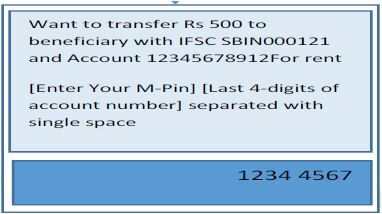 Even after providing the complete 11 digit IFSC code I am only getting the balance or MMID … pertaining to SBI account. Could you please help in this regard. It gives me error like “External application down”. What I have to do? I have SB accounts in two SBI branches and have provided same mobile number. Trying to get MMID without luck.. some time i get message “external application down” and “Connection problem or Invalid MMI code”. Please let me know how to get MMID of both SBI branches. What is BRKGB bank code? I loaded my ICICI Pocket Wallet account which is linked to my phone. However *99*44*1# option shows the balance as Zero. On web, as well as in app on my phone, it shows correct balance. Does it take some time to refresh the balance using this service? Dear Naresh ..I am not sure if the Wallet balance can be checked through this service. Suggest you to contact your banker. Do let us know any new info, kindly share it here. Thank you! ridiculous! I have not been able to transfer money, trying since 2 days. I get “try again” message or “unknown results” message or “external application down” message. The application terminates abruptly. Everything being done as per the instructions. this facility is not available in irctc (rail ticket) then how to pay using mobile for such catacaries? Dear sir according to the notice of paying penalty of 200% tax ,,Does tax will taken if Amount above 2.5 lac is already deposited before this announcement. My close friend says that ‘Sometime ago he received a warning about this number saying that if you dial this number all your details in your phone ? will be open to the hacker’. Please confirm! How far this is true? Dear BHUWALKA ..I don’t think so..This number has been launched by RBI and 51 banks have been offering this service. Very , very useful , Sreekanth ! Great service to all from you !! I deeply appreciate your initiatives !!! Since last few months I am receiving your mails regularly. Your way of presentation and explanation are marvelous which are not found in other bloggers who also write on various other such products. My hats off to you. Keep this trend going. Thank you dear Mr BHUWALKA . Keep visiting! If a user have multiple bank accounts with the same bank, how can he access a particular account? Dear Manoj..Tricky one..If you have multiple accounts in one bank, kindly try and let me know if both the accounts balances are shown or not?? If you have multiple account in same bank, you will receive balance for the primary account of yours maintained with the bank. In case of PNB, you can get balance of all the accounts. In case of YES Bank & Kotak Mahindra bank, you have to provide last 4 digit of the account number for which you want the details. Thank you dear Swati for providing this info. what if i have registered with my multiple bank account in multiple banks which balance *99# will show ? Dear Chaman ..You will get the bank balance of the bank for which you have entered the Short-code/IFSC code. If a person paid three years mediclaim premium(Rs.75000 for 3 years) in advance and get some discount form the insurance company, can he claims under section 80D Rs.25000/- for each financial year. Dear Taj..One can claim the entire premium only in the financial year in which the payment has been made. i have been started this service but now when i dial *99# it says you have no sufficient balance in your mobile.i am idea customer. i hv no balance in my mobile but its a free service.